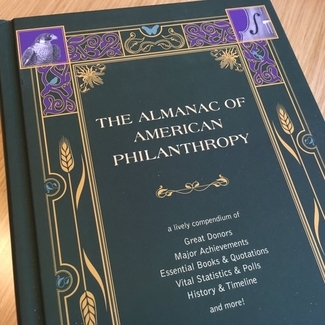 The Almanac of American Philanthropy is something new under the sun: a sweeping reference guide to one of the most remarkable institutions of American life  private charity. Published by the Philanthropy Roundtable and running more than 1,300 pages, it is the first definitive work on the history, variety, and impact of private giving in the United States. The scope of American philanthropy is unparalleled anywhere on Earth. In 2014, Americans gave nearly $360 billion to charity, the highest total ever recorded. Most of it didn't come from plutocrats and vast charitable endowments. Though the good works of private foundations, such as the Bill & Melinda Gates Foundation or the Ford Foundation, draw plenty of notice, they account for only 14 percent of charitable giving in this country. And just 5 percent comes from corporations. The overwhelming share of that $360 billion is donated by individuals. Not everyone gives, of course, but in this country those who don't are decidedly in the minority. Nearly seven out of 10 American households donate to at least one charitable cause each year, at an average annual rate of about $2,600. Philanthropic giving is a quintessentially American behavior, and always has been. It is also a radiant example of American exceptionalism. The new Almanac ranks 14 leading industrial countries by the amount of charity their citizens give yearly (calculated as a percentage of GDP). Americans were by far the most charitable  roughly twice as generous as Canadians, Spaniards, and the Irish, for instance, and more than 20 times as apt to give as Germans and Italians. As Karl Zinsmeister writes in the Almanac's lively and enlightening introduction, "philanthropy is a huge part of what makes America America." Huge in its moral and social impact, to be sure, but also huge as a matter of economics. The nonprofit sector in the United States employs 11 percent of the US workforce and supplies 6 percent of national GDP  and that doesn't include the economic impact of nearly 8 billion hours of service by 63 million American volunteers, an impact that last year was worth an estimated $184 billion. America's formidable "military-industrial complex," Zinsmeister notes, isn't nearly so formidable when compared with American philanthropy complex: Nonprofits surpassed defense as a share of the US economy more than two decades ago. For those raised to regard charitable giving as indispensable to meaningful lives and healthy societies, it can come as a jolt to discover not just that some people give little or nothing to charity, but that there are those who actually disparage charitable giving itself. In a 1964 interview, Ayn Rand said that her views on charity were "very simple: I do not consider it a major virtue and, above all, I do not consider it a moral duty." John Steinbeck, whose political views were as far to the left as Rand's were to the right, also disdained philanthropy. "Giving is a selfish pleasure, and in many cases is a downright destructive and evil thing," he railed. Rationalizations for not donating certainly aren't hard to find. "Most People Shouldn't Be Giving To Charity," advises an essay at the Business Insider website. A writer at Slate makes "The Economic Case Against Philanthropy." Yet anyone who doubts the amazing power of charity to work prodigies of good in the world need only open the Almanac of American Philanthropy to encounter a myriad of illustrations. The book ranges across four centuries of charitable accomplishments, documenting the fantastic profusion of philanthropic achievements that have advanced human health, alleviated poverty, promoted the arts, protected nature, deepened learning, supported religious communities, and fed the hungry at home and abroad. The charitable causes to which Americans have rallied and donated spans a mind-boggling spectrum  from abolishing slavery to combating smoking, from ministering to prisoners to encouraging transatlantic flight, from creating the Red Cross to caring for aged sailors, from protecting endangered species to building orchestras . . . and on and on. Zinsmeister refutes some common criticisms of philanthropy. To those who imagine that charity amounts to merely a drop in the bucket, he offers this perspective: The Gates Foundation alone  which is but a small sliver of US philanthropy  distributes more overseas assistance than the Italian government. And just one of the Gates endeavors, an overseas vaccine program, will save the lives of 8 million children. Yet as impressive as that is, it is dwarfed by the aid sent to the needy overseas by members of US religious organizations, which devote four and a half times as much to the effort as the Gates Foundation does. "Indeed, private US philanthropic aid of all sorts sent overseas now substantially exceeds the official foreign aid of the US government," Zinsmeister writes. Some drop. Some bucket. Sometimes philanthropy is pooh-poohed because of its lack of uniformity and clear direction. But in the Almanac's language, "a riotous patchwork can be a thing of a great beauty." Consider Goodwill Industries, which provides workforce training to 26 million beneficiaries annually. Goodwill's 3,000 stores take in more than $5 billion in revenue. And yet its operations are not standardized. Goodwill's 165 regional branches are autonomous in policy and funding, and each has its own board of directors. Habitat for Humanity and the Appalachian Mountain Club are other philanthropies that embrace a non-monolithic "patchwork" culture, and have achieved outstanding success. There are those whose first instinct is to turn to government when a social ill appears. Of course there are some functions for which government is well-suited. But on the whole, private philanthropic problem-solving will always be more nimble, more innovative, more individualized, and more efficient than anything the government can do. "In the United States I am even more struck by the innumerable multitude of little undertakings than by the extraordinary size of some of their �industrial enterprises," marveled Alexis de Tocqueville upon traveling through America in the 1830s. He wrote of his "daily astonishment" at the "immense works" carried out by the abundance of voluntary associations Americans formed. Nearly two centuries later, the vast diversity of private charity in this country is as astonishing and fruitful as ever. Lord knows we get plenty of things wrong in these United States, but our culture of philanthropy remains a wonder of the world.